The Second Circuit has its clerk's office and hears oral arguments at the Thurgood Marshall United States Courthouse at 40 Foley Square in Lower Manhattan. Due to renovations at that building, from 2006 until early 2013, the court temporarily relocated to the Daniel Patrick Moynihan United States Courthouse across Pearl Street from Foley Square, and certain court offices temporarily relocated to the Woolworth Building at 233 Broadway. Several notable judges have served on the Second Circuit, including three later named Associate Justices of the United States Supreme Court: John Marshall Harlan II, Thurgood Marshall, and Sonia Sotomayor. Judge Learned Hand served on the court from 1924 to 1961, as did his cousin, Augustus Noble Hand, from 1927 until 1953. Judge Henry Friendly served from 1959 to 1986. Thurgood Marshall United States Courthouse at 40 Centre Street. ^ Wallace was appointed as a circuit judge for the Second Circuit in 1882 by Chester A. Arthur. The Judiciary Act of 1891 reassigned his seat to what is now the U.S. Court of Appeals for the Second Circuit. ^ Lacombe was appointed as a circuit judge for the Second Circuit in 1887 by Grover Cleveland. 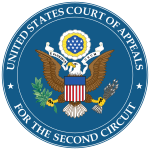 The Judiciary Act of 1891 reassigned his seat to what is now the U.S. Court of Appeals for the Second Circuit. The court has thirteen seats for active judges, numbered in the order in which they were filled. Judges who retire into senior status remain on the bench but leave their seat vacant. That seat is filled by the next circuit judge appointed by the president. ^ "Facelift Scheduled for Federal Courthouse - The New York Sun". www.nysun.com. Retrieved June 18, 2016. ^ "Standard Search". Federal Law Clerk Information System. Archived from the original on October 21, 2005. Retrieved May 29, 2005. ^ "Instructions for Judicial Directory". Website of the University of Texas Law School. Archived from the original on November 11, 2005. Retrieved July 4, 2005. ^ "New York Law Journal". New York Law Journal. Retrieved March 24, 2018. ^ Mahony, Edmund H. "Connecticut's Judge Christopher Droney to retire, creating vacancy for President Trump to fill on Second Circuit Court of Appeals". courant.com. Retrieved April 18, 2019. ^ Gurfein was nominated for a seat on the Second Circuit by President Nixon, but he was confirmed after Nixon's resignation and was appointed to the Second Circuit by (i.e., received his commission from) President Ford.